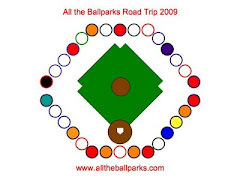 Here is a brief intro to the three of us going doing the All the Ballparks Summer 2009 Road Trip. Her/My Role: I am the doing most of the planning and trip documenting. I am making the route and will be putting together how we can do it in Mik's summer vacation once the MLB schedules are all released. I am also the one documenting the trip through things like blogging and taking photos. His Role: Mik is my little brother. He will turn 15 during the road trip. I am giving him the nickname "The Taste Tester" because over the years I have photographed him eating foods when we travel. It started as a him eating his way through Disneyland, Walt Disney World, and a Disney Cruise, but has now developed into him posing with different foods in his mouth on all our travels. He will be adding to his food scrapbook by trying different ballpark foods, especially things unique to certain ballparks. Also, he loves to narrate videos with his camera and may be entertaining readers with some video clips as we visit the ballparks. Lastly, Mik has cerebral palsy and, though, he is working on at least walking with his walker again, he will probably mostly use his wheelchair on the trip. Thus he will be helping to give accessibility reviews of the ballparks and other sites we hit along the way. His Role: My dad is the one doing the driving. He is also the one who will have to call 30 different ballpark ticket offices to get wheelchair seats to the games.